This is my 2nd one (also have navy). I love the size and weight of these. They say lightweight but have enough weight to them to add warmth and they wash up nicely! Lightweight and lovely, this 3-piece coverlet set freshens up any room and is a perfect layer for the spring and summer. Made from a polyester cotton blend, this coverlet is available in neutral shades with a timeless quilted pattern and a super soft brushed reverse. Finding a blanket/quilt for any bed that fits seems to be a huge issues when it comes to most that I get for my queen size bed. This Lightweight quilt from Zaria does not come up short on quality and size. I love the dark grey color of this set and the length that you see in the pictures is true to form. I put it on my queen bed and the sides almost reach the ground. It is made of a fairly lightweight material so if you have problems with overheating at night, but still want to have a cover over you then this is the perfect set. It is a fairly soft material that feels great to have as I snuggle in to bed. I love that it came with two coverlet shams/ pillow covers to help complete the look that you want for your bedroom. I have not washed it yet so I am unaware of how it will hold up once washed and if the color is steadfast, but as great a quality as it seems to be I would think that it would hold up well for years to come. The price point is well worth it. It might not be enough of a cover for winter, but you could always put another blanket underneath to help keep you warm during the colder months. I highly recommend this set and feel like it helped transform my bedroom to be more luxurious and put together. I received a discount on this product in order to purchase and review. All thoughts and opinions expressed in this review are my own. I received no other form of compensation. 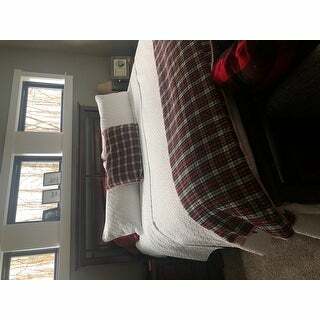 I believe the Zaria quilted coverlet is very worth the price. It has described accurately. The color is very bright white, the fabric is extremely soft. I use it as a top quilt (bedspread) on my queen-sized bed (pillow-top matress) and it does the job just fine. The quilt reaches to the bottom of the bed frame on each side and at the foot with plenty of room to "tuck" the bed pillows if I wish. It is the largest "queen size" quilt I've found online. I'm glad I checked the measurements in the description and did not order the king size. I don't even need the bed skirt. Yes, this did come wiht the two matching pillow shams which are just as soft. I do recommend this lightweight coverlet set. I am so very happy with this purchase. It is soft and just the right weight for summer sleeping. The pattern is so pretty without being overwhelming. I almost bought a size up to cover my extra deep mattress, but I'm glad I didn't as it is generously sized. Great buy! 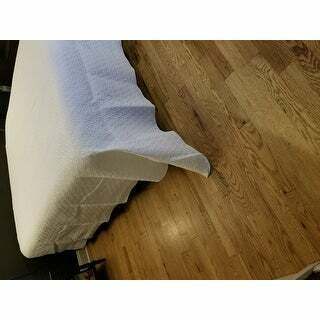 Our cats use our Cal King bed for a crash pad and playground, so I looked far and wide for a pet friendly, stain resistant spread to replace a tired, worn-out comforter that they’d thrashed. This coverlet, constructed with a tightly woven fabric, yet soft to the touch, is very durable and has survived their claws of destruction and kitty upchuck. I’ve had it on the bed for 7 weeks, fits easily in my home washing machine to launder, stain remover lifted out the cats’ handiwork. Fabric is a good weight for Southern California nights. No noticeable shrinking when laundered. The neutral Khaki color looks nice paired with a chocolate brown bedskirt I already owned. The coverlet covers the mattress well, but needs a bedskirt to hide the box springs. Shams fit king size pillows. Will definitely buy another set when I’m ready for a change. Coverlet fabric is very soft and comfortable. Shams are king size, 20x36. It is a little larger than I expected although sizing was right on. We are using mostly as a warm weather blanket, occasionally as a bedspread. Have not washed it as yet, but will probably have to take it to a laundermat.. I love the all cotton coverlet with matching pillow shams. It is oversized so I don't worry about the box springs showing on the sides. Great quilt - lightweight, navy color is beautiful - perfect! Simply elegant on the bed, and colour was true to the picture. Very soft and nice weight. Arrived promptly and was just what I have been looking for. I wanted a bedspread to replace the fussy duvet / bedskirt combination on my bed that always looked messy unless I took the time and effort to separately tuck in the sheet and blanket each morning. I haven't washed the coverlet yet, but looking at the construction I don't anticipate any problems. I will line dry. I am pleasantly surprised that the spread doesn't seem to be the cat hair magnet that I anticipated. Perfect for all Bedroom Styles! This comforter is light, comfortable and big. I have it on my California King bed which is 6 inches thinner and 4 inches longer than a regular king and it lays beautifully. I bought two of these for beds in rental condos that I manage. The other quilts we normally buy did not cover the box spring, these do that perfectly. The color is not a bright white, it has almost a grayish tint to the white, but that worked and we are happy with it. KIng shams description is 26 inches but they were 36 inches which was too big for my bed. 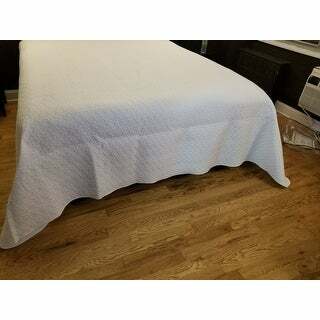 The quilt was very white which I wanted, and it did look and feel good, but I wanted smaller shams as I thought I was getting. Returned. I used this as a bed sheet rather coverlet, because I like to have the sheet more heavy and stable in the mattress. I will order one more set soon for my daughter and for my guest room bed. I like this piece...I’m using on a Murphy bed and what a nice surprise when pulled down. It freshened up the guest bedroom. With it white I can put on seasonal pillows for my guests! very happy with this quilt/coverlet set. its lightweight and the coverage is good. I bought the queen. This is a beautiful set! Washes up great and not overly warm. I have used it everyday for 3 years. Perfect for year around use. Definitely recommend. Oh my God I just love my new quilted coverlet set. I took it out put it on my bed and it fits amazingly perfect and it is so light weight but warm I couldn’t ask for anything better. These are stunning. 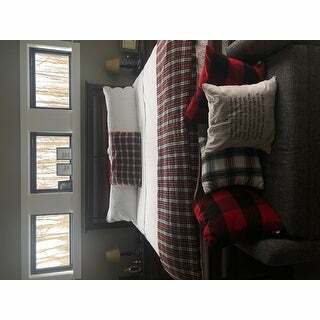 I have a luxury eight bedroom vacation rental and needed something beautiful and economical. I think I’ll need about 20 sets of these. Thus far I’m very pleased with the purchase. Purchased in a king navy to update bedding. Love the rich, deep color and the quality of the coverlet was very nice. Came with 2 shams in same size. Feel very good value for the money. I would recommend. "Can you get a larger size pillow sham for the Cal King size?" Unfortunately, we do not offer any shams that are larger for this set. "what is the difference between a COVERLET AND A BEDSPREAD?" A coverlet generally refers to a quilt set and is smaller in size than a bedspread/comforter. "Do you have a close up picture of the pattern? Thanks." Unfortunately, we do not have any additional images. We apologize for any inconvenience. "Is the white a true bright white? Not ivory or cream or off-white?" Mine is definitely a bright snow-white. Not a hint of cream or yellow. Yes, the Zaria Quilt Set is a true white. "Please tell us when White will be available in the King size.. Thanks!" Unfortunately, we do not have a re-stock date for the king sized option in white. We apologize for any inconvenience. "When will white be back in stock in Queen size?" We hope to restock additional sizes/colors if they become available again. We do not have a time frame for restocking. Please check back with us periodically. "I love it , I have washed it two times and it looks just as good as the day I got it."